Some of these studies that exonerate folic acid as a cancer-causing vitamin surprisingly included Dr. Byers’ name among the list of co-authors. Even if high-dose folic acid does increase the incidence and growth of cancer there is no way living cells are healthy without folic acid. It is clearly documented that without folic acid genes and chromosomes are unstable. [Advances Nutrition Jan 2012] Without folic acid cells become cancerous. 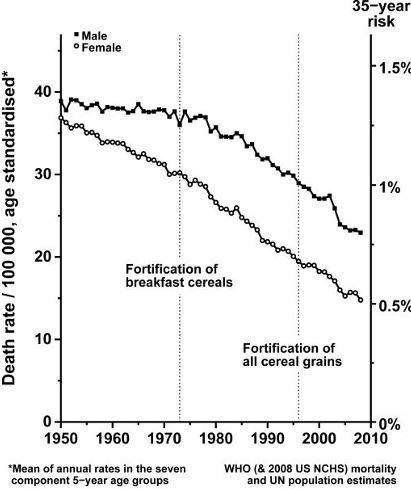 The following chart displays the colon-rectal cancer mortality rate over a 58-year period with notations when folic acid supplementation began in breakfast cereals and then all cereal grains. Does it appear to you that folic acid poses a cancer threat? The alleged association between cancer incidence, cancer growth and cancer mortality is that cancer patients tend to take vitamin supplements more so than healthy patients. For example in one study 14% of cancer treatment survivors initiated dietary supplement use after their diagnosis. [British Journal Nutrition March 31, 2015] This can make it appear there is a false increased association between vitamin supplements and cancer. Don’t run back to your oncologist to ask him or her whether folic acid supplementation poses a risk for cancer. One would think physicians would be prepared to answer patient questions about dietary supplement use. After all, more than 50% of Americans take dietary supplements and up to 70% of cancer patients. [Integrative Cancer Therapy Jan 2015] In one survey two of three oncologists conceded they were ignorant on how to advise patients taking dietary supplements. [Journal Clinical Oncology Dec 2014] –©2015 Bill Sardi, Knowledge of Health, Inc.